All polyethylene netting - strong, lightweight, exhibits no visible expansion or deflection over time. High quality knitted net utilizing a Raschel (knotless) knit. Designed to combat the effects and concerns of UV on plants and animals. Primary usage is to shade sunlight in horizontal applications and reduce wind in vertical applications for sensitive plants in the horticultural industry. Most commonly found in sub-tropical farming regions such as Florida, California, the mid-US, and Southeast Asia. Shade/Wind Cloth has a variety of feasible applications. General Purpose: Schoolyards, public parks, housing privacy applications, playgrounds, airports, railways/roadways, gazebos, carports, etc. Sporting Uses: Tennis courts, swimming pool enclosures, water slides, amusement parks, etc. Protection Netting: Falling rocks, road construction, soil erosion, drifting snow, storm waterways, sewage tank covers, etc. Aquaculture: Fish cage/pond covers, outside processing areas, etc. Agriculture: Snake cages, greenhouse covers, crop protection, livestock pens, etc. Human Factors: As UVB rays and skin cancer are drawing more attention and concern, a wider variety of applications are developing for children's playgrounds, restaurant patios, schoolyards, public parks, swimming pools, etc. Light and strong: Shade/Wind Cloth is constructed with a Raschel knit heavy-duty polyethylene yarn. Durability: The cloth is corrosion-resistant, and blended into the base material at the time of its extrusion is the maximum amount of Ultra-Violet inhibitor. This prevents discoloring and deterioration due to sunlight and maximizes product life. Shade Factors: The cloth is available in various shading factors: 20%, 30%, 40%, 50%, 60%, and 70% light reduction. UVB radiation is typically diffused 5% more than the light reduction. (ie. 70% light reduction will yield a 75% UVB reduction.) Note: Shade factors described are at Japan standards which are higher than North American standards, eg. Japan 70% = North America approximately 83%. Wind Factors: Used in vertical applications, 70% shade factor cloth typically diffuses 85% wind. The higher the wind, the greater the wind reduction efficiency. Non-Conductivity: Will not interfere with electrical or radio equipment. 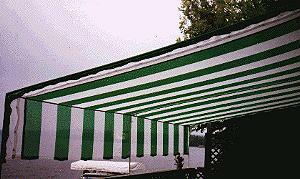 Colour Availability: The Shade/Wind Cloth is available in four standard colours: black, white, blue, and green. Other colours or colour combinations are available upon request. Click here for a chart of Shade/Wind Cloth net sizes.